Glacier Skywalk, Jasper National Park, Canadian Rockies | UNIGLOBE Direct Travel Ltd.
Adrenaline junkies always find fun in danger. Imagine a situation where only glass separates you with a 918 feet drop... Now tell me that your adrenaline is not on hyper-drive, and I'll tell you that you have guts of steel! Adrenaline junkies always find fun in danger. Adventure seekers long for the day they will experience something out of the ordinary. Well, today, you can find it. Welcome to the Glacier Skywalk in Jasper National Park in the Canadian Rockies. The experience is surreal. The birds will soar beneath you. The mixture of wildlife howling and waterfalls tumbling hundreds of feet below on the cliff-edge walkway make you feel indestructible. The awe-inspiring alpine life and glacial vistas will make you look like a professional photographer, while the unique ecosystems in the glaciers teach you a thing or two about survival. Live a little, will you? Life is too short not to. 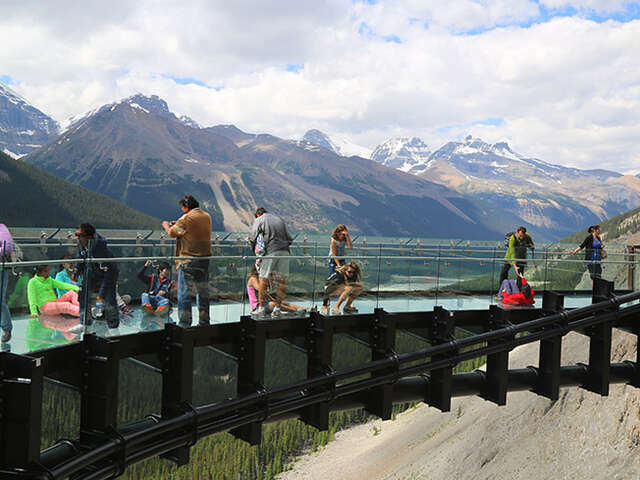 The Glacier Skywalk guarantees fun. Ask our travel experts about a festive break in the Canadian Rockies!